Alkaline Water Company is at the forefront of a booming industry. It has a historical top-line five-year CAGR of 140%. 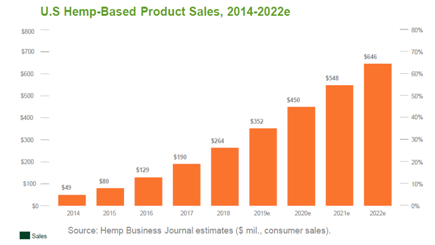 There's more growth ahead with the entrance into the booming CBD Industry. It's a medium- to long-term buy with possible 2x-3x upside. The Alkaline Water Company (NASDAQ:WTER) operates within the fast growing enhanced/value added water market. Alkaline has already been recognized as an industry leader, but there is a huge amount of upside potential for both the firm's top-line and share price. In this article we will delve into the reasons that we see this firm as a medium- to long-term buy. The firm has historically shown their ability to increase sales rapidly and has identified clear paths to continue this growth. Most notably, there are the strategies to 1) scale their primary Alkaline Water product to increase sales across the U.S., and 2) introduce an Alkaline Water-adjacent, Hemp-infused product linked to the fast-growing CBD industry. Moreover, we have seen the company executing on key operational targets to increase capacity, distribution and reach across the U.S. with an increasing number of reputable names forging partnerships and commercial relationships with Alkaline. We see excellent upside potential for this stock based on its organics growth potential. In addition, recent M&A whispers within the sector presents an interesting way of thinking about an investment in WTER. High-alkaline water is one of the fastest growing segments in the premium functional beverage industry. Through the ionization process, alkaline waters have fewer bitter low pH ions and higher overall pH levels. This in turn should, in theory, promote certain health benefits. Consumption volumes are estimated at 521m liters in 2017, with growth of 10% a year since 2013. Sales of Alkaline water rose by 18% to reach $631m in 2017, and industry insiders believe there's plenty more to come. So how can investors ride this Alkaline wave? F-Stat believe WTER presents an interesting opportunity for more risk-tolerant investors. As the name suggests, Alkaline Water Company is engaged in the manufacturing, distribution and marketing of their 8.8-pH balance, alkaline drinking water, otherwise known as Alkaline88®. Materials are sourced from multiple vendors, including their principal suppliers: Vav, Plastics Inc., Amcor Inc. and Packaging Corporation of America. They are then manufactured into alkaline water using WTER's proprietary technology. The company has developed an innovative state of the art proprietary electrolysis beverage process (ECA) that enhances its product with trace minerals and electrolytes and produces water high in alkalinity. The company began formally marketing in January 2013 in Southern California and Arizona, but have since expanded their presence to all 50 states and Washington, D.C. They currently deliver their products through c. 40,000 retail outlets around the U.S. In their first full year of operations, the firm brought in $0.56m in revenue while delivering products through 6,000 retail outlets in the U.S. This had grown by a factor of 14x to $7.1m within the two year to 2016 by which time the firm had increased its retail outlet presence to reach 25,000 retail outlets. The firm achieved an income of $19.8m in FY2018 with a year-over-year increase of 55%, with additional retail presence now delivering through 40,000 retail outlets. The firm has been able to grow so impressively by increasing their presence and expanding into new territories through their retail outlet partnerships. Their achievements can also be traced to sales and marketing efforts over this period. Their growth on the top line has been swift, especially when you consider that the increase between 2017 and 2018 is equal to all the revenues produced in 2016! Alkaline keeps on breaking its own records. For the first time the firm recorded two consecutive months (July 2018 and August 2018) with sales exceeding $3m in each month. The company then went on to record monthly sales of over $3.1m in November 2018. For this reason, we expect sales of c.$31-34m in FY2019. However, Alkaline Water is not yet profitable, making a loss of $6m in FY2018 ($3m in FY2017). We expect a slightly higher loss in FY 2019. However, it must be noted that losses in these early years are symptomatic of a new and growing firm. For example, Alkaline offered off-invoice incentives to the company's two largest customers, which is a norm within the beverage industry to establish new relationships. However, it has the negative effect of lowering margins. Due to the aforementioned ramp up in store presence, WTER also nearly doubled their sales and marketing expense in the first nine months of YE 2019. WTER has been aggressively gaining market share by growing faster than the industry, a trend that has continued into FY 2019. From the Q3 2019 report, we learned that Q-o-Q sales were up by 102% from last year. The segment growth rate is only 10.8%, so Alkaline has outperformed the enhanced (value added) water segment by c. 9 times. Partnership growth has been and will continue to be key for the future success of Alkaline. These partnerships will help the firm grow within two main streams: their "traditional" Alkaline water line and their foray in into hemp-infused water. Revenue has continued to grow in 2019 on the back of 6,500 additional stores nationwide at huge names including Walmart, Shopko, and Kroger in Q2. The firm achieved record sales in Q3 during which Alkaline also started selling products to over 7,500 CVS stores nationwide. 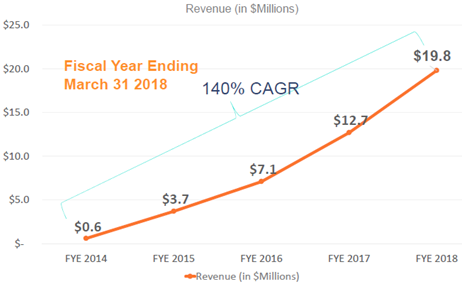 The consistent level of store growth over the past few years has been a key reason for their amazing revenue trajectory. Alkaline Company products can now be found in 39 of the top 50 U.S. grocers and in eight of the top 10 highest volume chains in the United States. Alkaline Water are entering into partnerships in order to increase their manufacturing capabilities and extend their reach. We see this as being a huge positive. The firm generated c. $20m in sales in FY 2018, while Alkaline has a capacity of $100m. We may see the firm hitting this target sooner rather than later given their desire to expand production. With a network of over 30 bottled water plants, Alkaline have identified Water Source One for their manufacturing capabilities to support growing demand. The firm is looking to capitalize on the removal of hemp from the federal Controlled Substances Act by introducing hemp extract-infused beverages. The company informed the market in 2018 about the creation of A88 Infused, a wholly owned subsidiary that acts as an incubator for new ideas and technologies. In January 2019, A88 Infused entered into a Brand Development Agreement with ArchPoint Group to design the cans and bottles for its new hemp-infused sparking and still water products. The firm is moving forward swiftly with this new product line and we are expecting more information in the coming weeks. This market is potentially huge, and could be a long lasting growth driver for the firm. This is especially true as they become more established in the U.S. and begin expanding internationally. In order to fuel this growth, the company will need ample amounts of cash over the next couple of years. Alkaline's cash burn rate has been increasing each year as their sales and marketing and capital expenditures ramp up. The burn rate increased from $245k per month at YE 2018 to $670k per month in the first nine months of FY 2019 as WTER increased capital expenditure on machinery (c.+$900k), and spent an extra $4.9m on sales and marketing among other expenses related to their business expansion. At the end of Q3, the firm had $3.1m in cash on the balance sheet, which represents c. 1.5 months of operating and investing capital. This may seem tight, but management is ahead of the game. In March 2019, Alkaline announced that they had closed a public offering of 4.2m shares (and an extra 0.6m of which are pursuant to the exercising of an option) for gross proceeds of $11.5m. Under the current cash burn rate, this leaves the firm liquid for another c. 17 months well into H2 2021. If all goes to plan, the firm may well be producing cash from their operations by this time. We should, however, note the various risks associated with WTER. First and foremost, there is no formal medical acknowledgement of the benefits of alkaline water (one of the main sources of demand). The key risk to WTER concerns the core premise. This industry is booming on the back of the shifting consumer trends towards more health conscious choices, but health practitioners and researchers are yet to agree on the benefits of alkaline water. In fact, there is currently "no evidence that water marketed as alkaline is better for your health than tap water." Should more conclusive negative research come out, the firm's prospects may dwindle. This is, however, mitigated by the firm's entrance into a new product line. The development of alkaline water-adjacent products (hemp products) should help to mitigate this risk. In addition, Alkaline regard their proprietary technology that produces 8.8ph alkaline water to be a source of competitive advantage. The firm sees this as one of the factors that make them better able to meet consumer needs. However, without a patent, there is little to stop competitors from producing the exact same 8.8ph product. The firm is also susceptible to concentration risk. Alkaline Water is highly exposed to three customers who account for 51% of their accounts receivable. This is quite a large exposure given that accounts receivable makes up 43% of the firm's total assets. One single client makes up 25%, so a loss of business or increased credit risk from this counter-party may be detrimental for the firm. We hope to see more diversification in FY 2019. We look to other similar firms to form a basis for comparison. A great firm for comparison is privately owned Essentia, which was the first movers into the alkaline water trend (they started operations in 2008). If Alkaline Water Company is regarded as No. 2 in the world of alkaline water Brands, Essentia is No. 1. In October 2018, Essentia were labelled as the Best Functional Water by the Global Bottled Water Awards. Essentia's growth has been similarly spectacular recording a 59% sales growth rate in FY2018 allowing the firm to reach $196m in revenue with 90,000 retailers. So its no wonder the firm has been attracting M&A interest. CNBC reported last year that should the company find a buyer, the price could fetch 5x of sales (Essentia's FY2017 sales were in the region of USD120m) with the firm valued at $500m. Looking at other operators in this market, a P/S of around 4x seems fair for these high growth beverage firms with others close to the market - i.e., NBEVs P/EV is currently 8.10x while its P/S is 5.22x. We believe that the firm should attract suitors (such as larger beverage companies looking to enter this innovative space) at a similar valuation before it reaches the $100m milestone. Applying a 4x P/S to our forecasted FY 2019 sales figure of $31m, the firms valuation comes to $124m, or an increase in share price from $2.24 to $3.16 (our YE 2019 price target) a 41% upside. As the firm continues to grow their top line and show evidence that margins can be kept under control, we see this stock price exceeding its all time high of $5.56. Alkaline88 was ranked the 10th largest in the enhanced (value-added) water segment in dollar sales. The firm is now the second-fastest growing branded water among the top 20 brands in the U.S. This market has been booming over the last few years and still has plenty of room to grow. WTER may be the best opportunity for investors to take advantage of this trend. The firm has shown its ability to grow in the past, and has consistently proved that they can execute their strategy as evidenced by the stream of new relationships and product launches reported by management and the media. We currently rate WTER as a speculative medium- to long-term buy. The story is certainly compelling enough, but more information may be required before entering into a position. Management will provide commentary on FY 2019 in the near future. We will be looking for guidance on the firm's operating margins with a focus on timing for net profitability, CBD product launch, and progress on the East Coast.